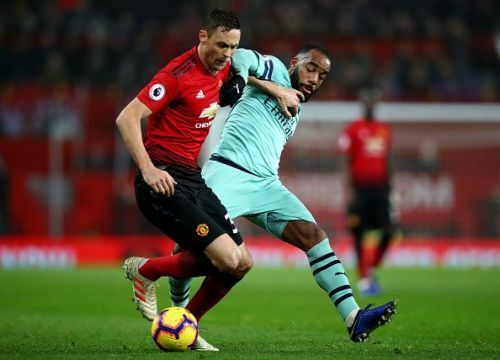 As predicted earlier, Manchester United was not going to lose to fierce rivals Arsenal in their home territory. It would have been an added a low blow to an already injured side if Jose Mourinho's men had lost, while Arsenal, on the other hand, are now on the cusp of something special. The Gunners are unbeaten in 20 matches across all competitions. The last time this happened, they reigned supreme in 'the Invincibles' era. That notwithstanding, last night's match had the proper ingredients of a cracker that this fixture has traditionally been. A draw would serve neither team's interests in terms of their immediate targets. For Arsenal, it would be to keep up with the top two Premier League high flyers. For United, it was to simply claw their way back to the top four, a target that looks harder by the day. Watching United against Arsenal was reminiscent of the good old Ferguson-Wenger battles. There were several unexpected moments with referees on the spot. These were some notable moments from the game. There were several injuries in this match. 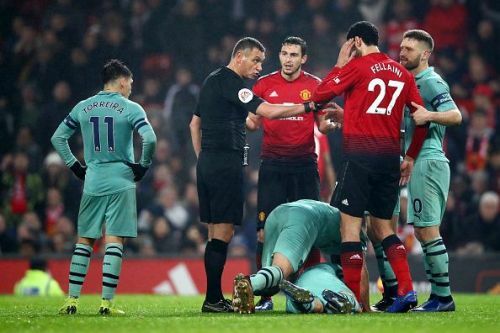 Like any classic Manchester United-Arsenal match, it was a highly physical match. Combine this with a slippery surface and the result is injuries. The Gunners were forced into two injury-related changes. Their skipper on the day Aaron Ramsey, had to be replaced while Rob Holding was also injured and replaced. This left Unai Emery with one wild card left which proved instrumental. Lucas Torreira also had a few problems in this match. Shkodran Mustafi appeared to have some difficulties barely a minute after Arsenal had made their final change but was able to soldier on. At the other end, Anthony Martial overcommitted when tracking back and as a result, pulled a muscle in the second half. He was one of United's potent players up to that point. All in all, it was a feisty affair with lots of tackles in different areas of the pitch as expected in a fixture like this.